Art NuVogue: Creation of the Red Queen! Creation of the Red Queen! 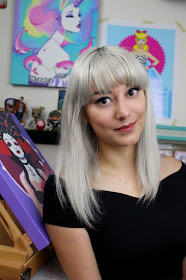 On this episode of Art NuVogue I'm working on the third in a series of Wonderland themed paintings for my upcoming solo show entitled, "Let Them Play Croquet" Check out my artistic process and follow me from inspiration to completion! Thanks for watching! It turned out absolutely stunning! I liked seeing how you included your first attempt in the video. Sometimes I get at the same point where I just don't feel inspired by my own work anymore (while I know the idea still has potential). It's inspiring to see somebody else in that place and persevering. And I think your painting is really strong. Wouldn't have thought of the green but love it! We're All Mad Here! Creation of The Mad Hattress!